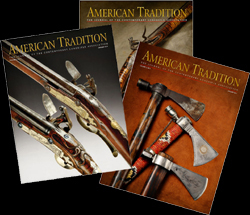 As a member you will receive American Tradition, a full color magazine twice a year. 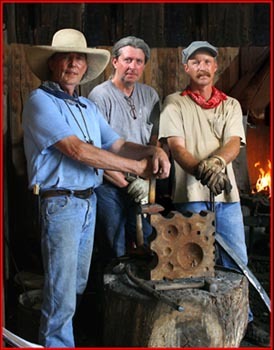 In 2008 the Contemporary Longrifle Foundation (the fund raising arm of the CLA) developed a program to raise funds for the organization and to showcase the art of hand making a Kentucky Longrifle. The program came about through the generosity of the three House brothers, Hershel, Frank and John of Woodbury, Kentucky who approached with Foundation with an offer to build a rifle to be auctioned at the CLA Annual Show as a means of raising money for the organization. After discussion between the Foundation and the brothers it was agreed that they would completely hand make a Kentucky Longrifle, which would demonstrate the ultimate state of the art for an organization based on the Kentucky Longrifle and its related art. It was also decided that the rifle would be offered through a nationwide raffle to give as many people an opportunity to own this rare and wondrous work by these talented brothers. This undertaking became known as "An American Tradition - The House Brothers Project". After two years (one to build the rifle, and another to sell raffle tickets) at the Contemporary Longrifle Association’s Annual Meeting and Show at Lexington, Kentucky on August 15, 2009, the lucky winner’s name was drawn, and it was Jerry Raisor of Owenton, Kentucky. The elated and surprised Jerry was in the room at the time of the drawing and took possession of the handmade longrifle. The Contemporary Longrifle Association is a non-profit organization of collaborative members, who are collectors, makers and students dedicated to the art of contemporary longrifles, accoutrements and related items made after the mid-twentieth century. The Contemporary Longrifle Foundation is the educational and fund raising arm of the Association. Through the collective efforts of three renowned Kentucky gun makers, Hershel, Frank, and John House, a special handmade longrifle was created for the CLF as a fundraiser. The proceeds from the “An American Tradition - House Brothers Handmade Flintlock Longrifle Project” will enable the Foundation to continue its mission to promote the art of the Kentucky Longrifle and related arts through publications, museum exhibits, grants, and promotion of contemporary artists. Such a rare and unusual event as hand making a Kentucky Longrifle deserves to be recorded and the CLF made sure it has been accomplished. The complete building process took more than a year and was fully documented by photographers Ric Lambert, H. David Wright and Steve Auvenshine. These talented photographers captured the building process in digital photography. Through the generosity of these individuals we have a lasting record of one of the unique processes of “Following the Tradition”. Giveaway tickets on the “American Tradition” longrifle were offered for a donation of $5 each or 5 for $20. This superb once-in-a-lifetime rifle was awarded to a lucky recipient (Jerry Raisor) at a drawing at the Annual CLA Show on August 15th, 2009. This rifle is completely handmade - the forged barrel, the lock, triggers, iron mounted hardware and screws are made by hand in the same tradition as those by American gunmakers in the 18th century. The rifle is built in their nationally recognized style, known as the “Woodbury School”, and named for the small Kentucky town in which the brothers grew up. The House Brothers have included many of their personal and unique attributes for which they are so well known. The rifle is relief carved, and sports engraved iron mounts. The patchbox is tastefully engraved with touches of sterling silver overlays and a sterling silver thumbpiece (for a future owner’s initials) accents the wrist area. The 41” swamped barrel is rifled in .45 caliber. The only thing not made by Hershel, Frank, and John is the fine piece of curly maple wood in which the rifle is stocked. This piece of hand selected wood was donated by Freddie Harrison of Bradford, Tennessee. A supplier of stock blanks to muzzle loading gun makers for more than 30 years, Freddie volunteered one of his best pieces of wood for this unique project. The “American Tradition” longrifle was raffled by the Contemporary Longrifle Foundation through a year long program which began with the unveiling of the rifle at the Contemporary Longrifle Association Annual Show in Lexington, Kentucky in August of 2008. The raffle was concluded at the Lexington show in August 2009 when Jerry Raisor of Owenton, Kentucky took home one of history’s most unique contemporary longrifles. No program is successful without all the ingredients involved to bring it to fruition. Starting with a unique, handmade longrifle, crafted through many hours of work by Hershel, Frank and John, coupled with the many, many hours of voluntary work by the CLA staff, volunteers and the support of the membership, thousands of raffle tickets were sold and the project was deemed an unqualified success. The program was also generously supported by many in the media profession and articles were published in Muzzleloader, Muzzle Blasts, On The Trail, and Smoke & Fire news. An article in the NRA publication American Rifleman went to more than 4 million NRA members, and the CLA Association and the House Brothers Project received an additional shot in the arm with nationwide attention to the project. The CLA was organized as an association of contemporary muzzleloading makers, collectors and related artists. This association recognizes the scope of collecting as traditional muzzleloading rifles, pistols, fowlers, their accoutrements and related objects handmade after the mid-twentieth century. MEMBERSHIP DETAILS: Membership dues are $50 annually, January through December. If a member joins after October 1, membership is good through the following year.